Lolcat meme is a classic meme that can be traced back to 4chan and the postings for “Caturdays” in 2006. The I CAN HAZ CHEEZBURGER? website has propelled these sweet faced, smart-assed memes into the mainstream web culture, spawing other cat sites like Hipster Kitty, Ceiling Cat, and Nyancat. Lolcats have become so mainstream that you can find Lolcat calendars and books at your local Borders Barnes and Noble. What is the meme: This is an “image macro” of a totally cute kitteh with one or two lines of text running across the picture. The text generally contrasts with the cute picture, creating a humorous image, hence the name given to the meme. 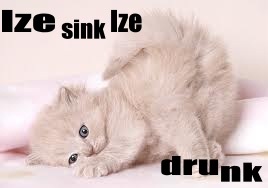 Another unique feature to the Lolcats is the strange way verbs are used, the lack of proper grammar and purposefully misspelled words like teh and kitteh. This pidgin comes from a combination of kitty speak and our far superior human language but you have to give the cute kittehs credit with trying to communicate with us – don’t see anything coming from the cute puppy camp now do you??? Why we like this meme: I think the appeal of this meme comes from its accessibility to everyday instances in our real lives (or the lives of our cats) expressed through harmless humor. The possibilities for creating your own meme are endless due in part to the simplicity of the meme. Cute, fuzzy, sweet and innocent kittens are everywhere; the Internet, your house, in a box outside the local shopping center, & image sites like Flickr or Google Images – find one, add some funny text and you’ve done it. Easy, peasy, lemon squeezy! Where you can find lolcats: These memes have been turned into games, posters, t-shirts, YouTube videos and have been written up by legit publications such as Entertainment Weekly and BBC News.